Multiformat Embroidery Design CD, When we released our Patchwork Pups collection this year we got a lot of great feedback and an overwhelming request for us to do cats! 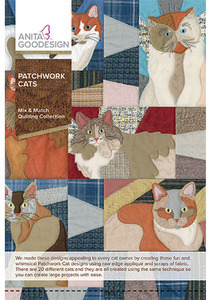 So without further adieu, we are proud to present to you our Patchwork Cats collection! Just like with Patchwork Pups, everyone who asks for a cat collection just really wants their own cat. So as designers this created a problem, how can we possibly digitize hundreds of cat breeds? We decided to go a different route and make the designs appealing to every cat owner by creating these fun whimsical Patchwork Cat designs using raw edge appliqué and fun scraps of fabric. 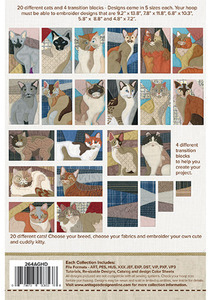 There are 20 different cats and they are all created using the same technique so you can create large projects with ease. We created 2 fun projects using the Patchwork Cats, the first project was a small throw pillow and the second was a large quilt. The best part about this collection is that you can combine it with other Anita Goodesign collections! These designs were all created to be used with any of our other Mix and Match collections. These rectangles and squares can be combined with our Quilting Essentials and Beautiful Blocks and Borders collections for truly spectacular results. Each of the designs in this collection come in 5 different sizes.